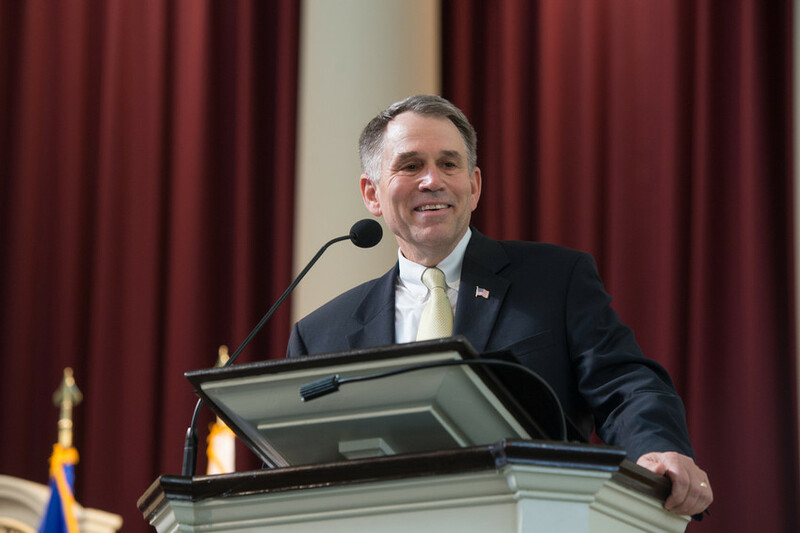 Retired U.S. Army Major General John Batiste shares his perspectives on Veterans Day during ceremonies in Hendricks Chapel Tuesday. Before his keynote address during the Veterans Day Ceremony Tuesday, retired U.S. Army Maj. Gen. John Batiste called upon fellow veterans and their families to be recognized for their service from a grateful audience. Dozens of men and women rose to applause in Hendricks Chapel. 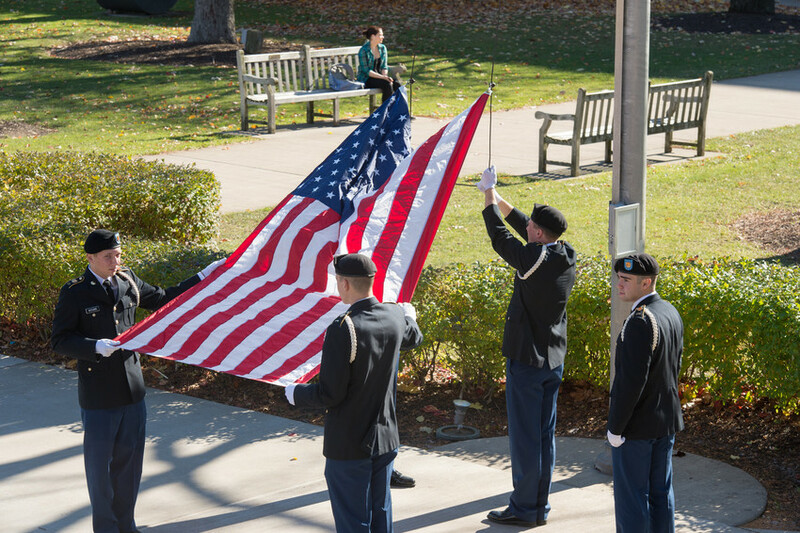 With music by the 198th Army Band and the Syracuse University Singers, words and prayers, and long-held ceremonial traditions, the campus community honored veterans during its annual Veterans Day Ceremony. 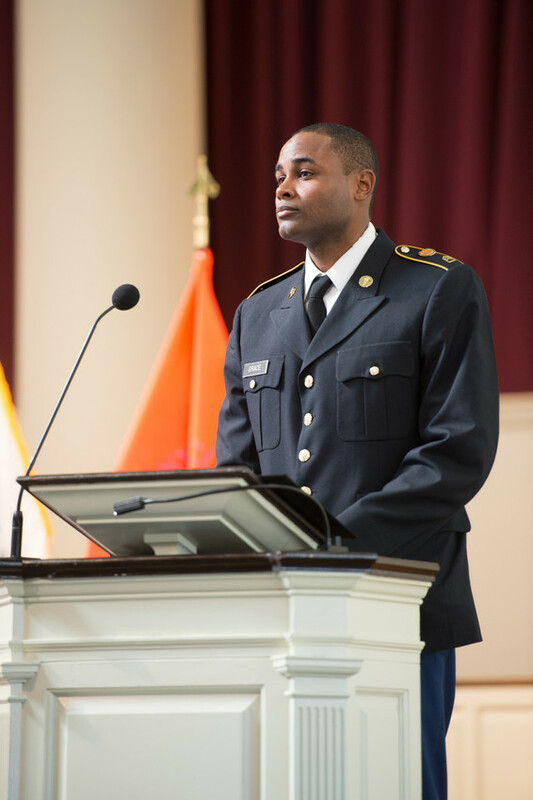 Army ROTC Cadet Battalion Commander Jared Grace, a graduate architecture student, leads the Veterans Day Ceremony. Army ROTC Cadet Battalion Commander Jared Grace, a third-year graduate architecture student, led the ceremonies. Chancellor and President Kent Syverud welcomed those in attendance, thanked those involved in the day’s events and introduced Batiste. Batiste, who retired in 2005 after 31 years in the military, served in many leadership and staff positions, including during deployments to Saudi Arabia and Iraq during Operations Desert Shield and Storm and to Kuwait and Iraq during Operation Iraqi Freedom II. His final assignment was as commanding general of the 1st Infantry Division. During his command in 2004-05, he became concerned over the war planning and lack of a comprehensive national strategy. Instead of accepting a promotion to three-star general, Batiste retired and spoke out about his concerns. “It further underscored the defining quality of Gen. Batiste’s character and of his career—his passion, his outspoken advocacy on behalf of and support for our nation’s soldiers and our nation’s veterans,” Chancellor Syverud said. Batiste is president and CEO of Buffalo Armory, which focuses on producing better steel to protect troops. He is also an advocate for veterans’ issues, including treatment for those suffering from post-traumatic stress and traumatic brain injuries. Batiste noted that the United States is still in combat with extremists 13 years after 9/11 and has other concerns with unfriendly nations. “Bottom line, we live in a very dangerous world today,” Batiste said. The U.S. military relies on volunteers in its missions and since the Vietnam era, “this has provided us with the best trained, most capable, best equipped military in the world,” Batiste said. ROTC cadets raise the flag during Veterans Day ceremonies outside of Hendricks Chapel Tuesday. This reliance on volunteers has also led to most Americans paying little or no attention to the sacrifice of warriors and their families, with less than 1 percent of the population having served abroad since 9/11, Batiste said. “With this gap between a volunteer military and the nation it serves, our political leaders will be more inclined to solve the world’s problems with the use of force,” Batiste said. But he noted that there are other ways to resolve conflict. “Strategy must be deliberately developed with the ends, ways and means clearly defined and in balance,” Batiste said. Batiste also shared his thoughts on what it means to be a veteran and the common thread among service members. He described veterans as a diverse group, who value teamwork and train hard to set the standard for combat operations. Batiste also noted that many veterans have seen the the brutality of war. “Many of us endured combat, defined by prolonged periods of boredom interrupted by moments of sheer terror,” he said. “We all understand that how a country treats its veterans defines its national character,” Batiste said, and that war preparations must include the follow-through in transitioning veterans back to the nation after the guns are silent. Batiste noted the special emphasis at Syracuse University on veterans, with the support it provides veterans and the work of the Institute for Veterans and Military Families, that “sets the standard” to tie together the work of government agencies and other organizations to assist veterans. “There is a spirit here that is palpable,” he said. Student veteran John Higgins speaks about the perspectives that veterans bring to a college campus during Veterans Day ceremonies. Another speaker, Lt. Col. Jonathan Landis, commander of Syracuse University Air Force ROTC, also suggested ways for people to acknowledge the service of veterans by devoting time to veterans’ organizations or encouraging businesses to hire veterans. “A heartfelt thank you is a good place to start, but I encourage you to let your words bring forth action,” said Landis, a professor of aerospace science. Student veteran John Higgins ’15 shared some history of veterans at Syracuse University, including how Chancellor William Tolley threw open the doors to returning World War II vets. 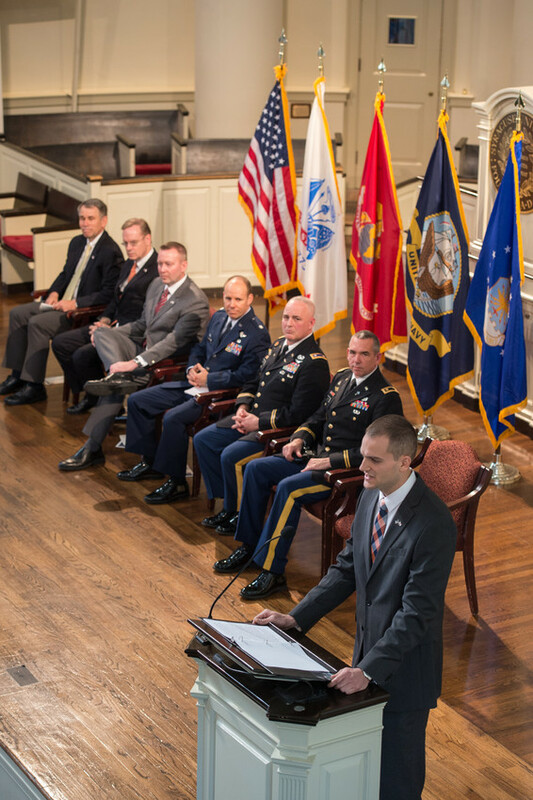 “Student veterans add a unique perspective to this university, both inside and outside the classroom,” said Higgins, noting how many veterans bring different life experiences and ideas than traditional students that enhance the classroom and discussions.